Optical Profile Cutting Machine-Gas/ Plasma is a modem co-ordinates gas profile cutting machine with photoelectric control. 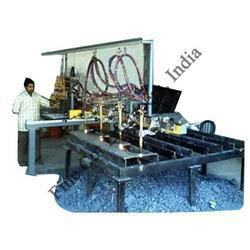 The machine is specially developed for use in small and medium size workshop. 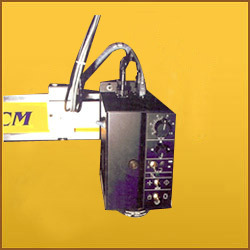 The machine is designed for high accuracy in cutting. There is no need of metal templates. The state-of-the-art photoelectric tracer (ratio 1:1) can follow templates silhouettes or line drawn with a minimum line width of 0.8 mm. The machine can be equipped with four manual or motorised machine cutting torches thus making it suitable or either for one of batch production of mass production. The machine has cutting width of 1.5 meters & the cutting length can be increased to any length by extending the machine has many useful features for quantity and productivity in profile cutting of mild steel. The machine can be ungraded with a CNC controller. Our range of portable profile cutting machine is a portable lightweight radial arm profile cutting machine which is capable of cutting profile of 30 mm to 2000 mm by suitably mounting the template on the machine. These machines have a magnetic tracer to trace the mounted template and the profile is cut. 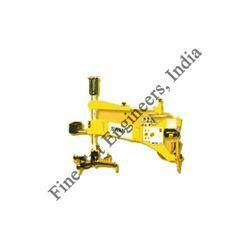 The portable profile cutting machines can be easily moved with the ball castors provided with it. Universal single phase Power Motor 220 volt. The HL-90 is a state of the art facing unit and offers the users complete flexibility with total ease of operation. Photo electric tracing device (Ratio 1:1) can follow paper terplates, silhouetes or line drawings (Minimum Line Width 0.8 mm). Looking for Optical Profile Cutting Machines ?